An examination of the trace plots for and (see Output 59.13.1) reveals that the sampling has gone well with no particular concerns about the convergence or mixing of the chains. The MCMC results are shown in Output 59.13.2. The Monte Carlo standard errors and effective sample sizes are shown in Output 59.13.3. 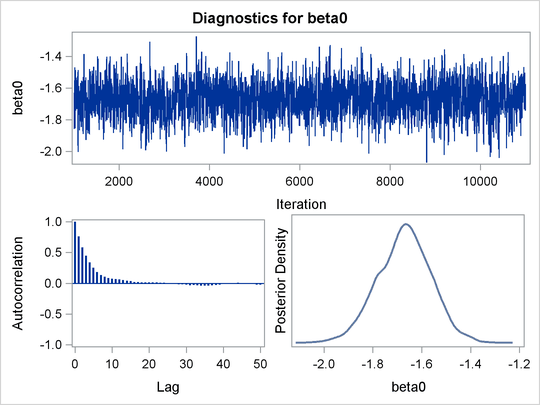 The posterior means for and are estimated with high precision, with small standard errors with respect to the standard deviation. This indicates that the mean estimates have stabilized and do not vary greatly in the course of the simulation. The effective sample sizes are roughly the same for both parameters. Output 59.13.4 displays the posterior summary statistics. The PROC FREQ results are shown in Output 59.13.5. You can examine the estimated survival probabilities over time individually, either through the posterior summary statistics or by looking at the kernel density plots. Alternatively, you might find it more informative to examine these quantities in relation with each other. For example, you can use a side-by-side box plot to display these posterior distributions by using PROC SGPLOT (Chapter 21 in Chapter 21: Statistical Graphics Using ODS,). First you need to take the posterior output data set Weisurvout and stack variables that you want to plot. For example, to plot all the survival times for patients who received interferon, you want to stack surv_inf1–surv_inf10. The macro %Stackdata takes an input data set dataset, stacks the wanted variables vars, and outputs them into the output data set. There is a clear decreasing trend over time of the survival probabilities for patients who receive the treatment. You might ask how does this group compare to those who did not receive the treatment? In this case, you want to overlay the two predicted curves for the two groups of patients and add the corresponding credible interval. See Output 59.13.7. To generate the graph, you first take the posterior mean estimates from the ODS output table ds and the lower and upper HPD interval estimates is, store them in the data set Surv, and draw the figure by using PROC SGPLOT. In Output 59.13.7, the solid line is the survival curve for patients who received interferon; the shaded region centers at the solid line is the 95% HPD intervals; the medium-dashed line is the survival curve for patients who did not receive interferon; and the shaded region around the dashed line is the corresponding 95% HPD intervals. 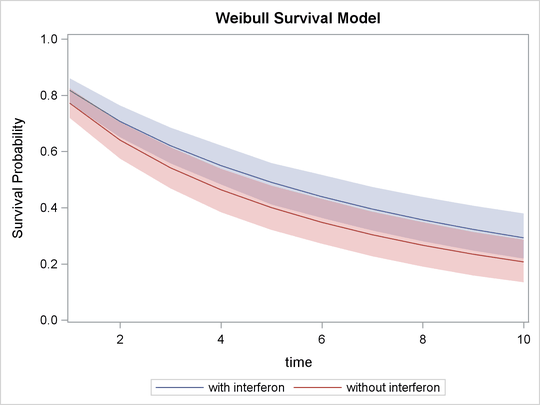 The plot suggests that there is an effect of using interferon because patients who received interferon have sustained better survival probabilities than those who did not. However, the effect might not be very significant, as the 95% credible intervals of the two groups do overlap. For more on these interferon studies, see Ibrahim, Chen, and Lipsitz (2001). Although the evidence from the Weibull model fit shows that the posterior distribution of has a significant amount of density mass less than 1, suggesting that the Weibull model is a better fit to the data than the exponential model, you might still be interested in comparing the two models more formally. 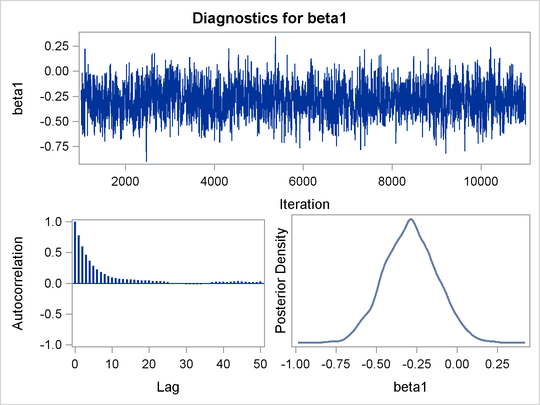 You can use the Bayesian model selection criterion (see the section Deviance Information Criterion (DIC) in Chapter 7: Introduction to Bayesian Analysis Procedures,) to determine which model fits the data better. The DIC option requests the calculation of DIC, and the table is displayed in Output 59.13.8. The note in Output 59.13.8 reminds you of the importance of ensuring identical likelihood functions when you use the GENERAL function. The DIC value is 861.6. Output 59.13.9 displays the DIC table. The DIC value of 872.075 is greater than 861. 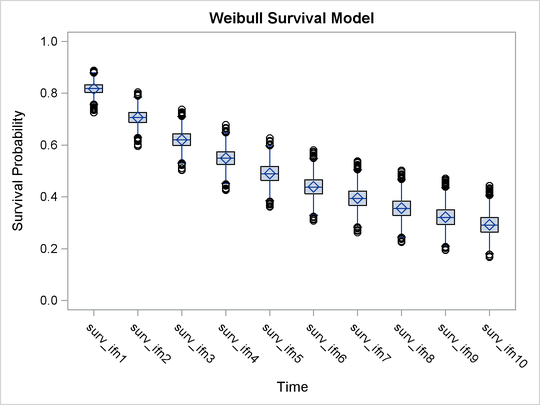 A smaller DIC indicates a better fit to the data; hence, you can conclude that the Weibull model is more appropriate for this data set. You can see the equivalencing of the exponential model you fitted in Exponential Survival Model by running the following comparison.